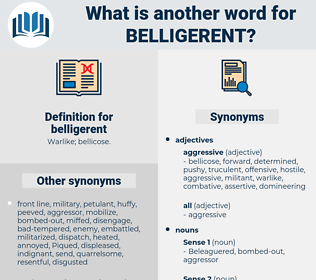 What is another word for belligerent? militant, conflicting, antagonistic, rival, adversarial, wartime. belligerence, belligerency, hostile, conflict, hostility. agreeable, peaceful, cooperative, friendly, helping, nice, kind, calm, peaceloving. amiable, nonbelligerent, obliging, benevolent, good-tempered, good-natured, mild, relaxed, quiet, gracious, easygoing, tranquil, pleasant, kindhearted, benign, ingratiating, nonaggressive, serene, gentle, unwarlike. Turner's jaw came out with a belligerent set, but he answered slowly. All the evening he felt particularly belligerent toward Sligo Moultrie; and yet a close observer would have discovered no occasion in the conduct of the young man for such a feeling upon Abel's part.